Jack Jolly insists Birmingham and Solihull aren’t feeling any pressure in the National Two South relegation battle and admits their destiny is in their own hands. The Midlands club currently sit bottom of the division and find themselves 16 points adrift of safety. Pete Glackin’s men have 10 games remaining in their season to dig themselves out of trouble, but the Bees’ club captain says his side need to focus on themselves if they are to avoid an immediate return to Midlands Premier. Having also been deducted five points at the beginning of the season (for fielding an ineligible player towards the end of the 2017/18 campaign), the Bees are not down and out just yet. 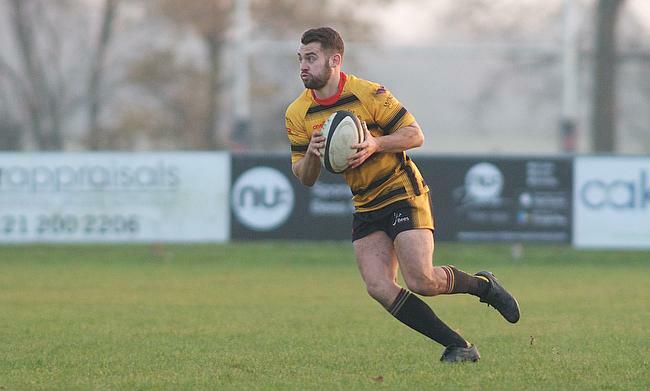 National Two South – Round 19 Review: Bottom three all victorious in #Nat2s. “It has been a tough one this season,” said Jolly. “It has been frustrating at times. Every team has sort of had their injury problems, but I have never experienced as many injures as we’ve had. However, we are still in there with a shout. We firmly believe that our destiny is in our own hands going into the last third of the season. “The belief in the squad is high. There has never been any panic. There is no point piling loads of pressure on ourselves, because it starts to build and you want players to express themselves and play their best rugby. Birmingham and Solihull were relegated from National Two North in 2015, but they secured a return to the fourth tier last April after clinching the Midlands Premier title. However, rather than moving back into National Two North, the Bees had to settle for a spot in the South due to an imbalance of teams in the division following Chinnor’s promotion to National One. Last season, Broadstreet were in the same position and failed to evade relegation, but Jolly revealed his side have relished the challenge this term. “I do think the South league is slightly stronger based,” he said. “The speed of the game is a lot quicker. I think if wwe were to be more suited to one of the leagues, it would probably have been the North, but going to places like Redruth the other week and Canterbury in a couple of weeks’ time; they are places I have never played at before. Jolly has experienced a lot of different tests during his long affiliation with the Bees and his responsibility at his boyhood club was increased when he was handed the captain’s armband at the beginning of the 2017/18 season. The scrum-half also sat down with Pete Glackin to discuss Birmingham and Solihull’s aims for the campaign and Jolly was able to lead his side to their main goal. “It was a great honour to be asked to captain the side,” Jolly said. “Pearly [Stewart Pearl] and Glacks, our coaches, are big on player responsibility and they are great to work alongside and work for. “I thoroughly enjoyed doing it in my first year and to get promotion last year, it makes you think it is quite easy! Promotion was the main target for everyone involved really. Pete and I spoke when he asked me to be captain and the first thing I said to him was that I wanted to get promoted. “The club [who were forced into voluntary liquidation in 2009] has had quite a tough few years or so and it has taken quite a lot of time an effort from a lot of people involved to keep the club going. Their bid to stay in National Two South continues this weekend when they take on Guernsey in a huge clash at the bottom of the division. Guernsey will arrive at Portway three points above their hosts and Jordan Reynolds’ side have recently picked up two vital wins to breathe new life into their survival challenge. Victories over Barnes and Clifton has given the Raiders belief while back to back home wins for the Bees against Worthing Raiders and Dings Crusaders has kept the Bees’ hopes alive. Birmingham and Solihull did beat Guernsey 28-19 back in October, however ahead of this Saturday, Jolly feels the pressure will be on the Channel Island outfit based on the remaining games each side has left to play. “We have got 10 games to go. Six are at home and four are away so if we win all our home games, we will give ourselves a chance. “It is a big game, but every game is a big game. We are just taking it one step at a time. I do think there is more pressure on Guernsey than there is us to be honest because I think they have got slightly more challenging fixtures than we have, but we will see. “When we went over there in October, it was a great experience. We had never played them before and to get the win was great, but the teams have changed since then. “Yes, it does give you a bit of comfort that we beat them at their ground, but you just have to put that to one side and take the game for what it is on Saturday. Previous form doesn’t carry much weight going into games like this.